This view from a NASA all sky camera located at Cartersville, Ga., shows a brilliant meteor as it streaked over the Atlanta area on Aug. 28, 2011. A bright meteor lit up the night sky above Atlanta on Sunday (Aug. 28) in a dazzling display caught by NASA cameras. The meteor streaked over Atlanta, Ga., and its surrounding cities at the mind-blowing speed of about 52,800 mph (84,970 kph). 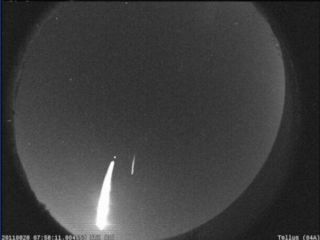 "The meteor was too bright for the all-sky camera in Cartersville, Ga., to accurately determine the center of light, so manual analysis will be required to determine a more accurate end point," NASA meteor scientist Bill Cooke wrote in a blog post. Cooke is the head of NASA's Meteoroid Environment Office at the Marshall Space Flight Center in Huntsville, Ala. The meteor was streaking over the Atlanta suburb of Duluth at an altitude of about 65 miles (105 kilometers) when it was first spotted, and fizzled out at a point about 26 miles (42 km) between the towns of Stockbridge and McDonough. Astronomers have different names for space rocks depending on where they are. Small rocks and dust particles in space are considered meteoroids until they encounter Earth's atmosphere. If they blaze up in a bright fireball or flash, they are called meteors, and if any remnants reach the Earth's surface, they are called meteorites.